As of July 2017, a total of 862,858 cases of cholera have been reported, resulting in 2,177 deaths, most being children. Nearly 5,000 cases are reported per day. Ongoing conflict, destroyed water and health infrastructure, and malnutrition have caused the people to become more vulnerable. As if this were not bad enough, the Saudi Arabian blockage of airports, sea routes, and highways has blocked humanitarian aid from entering Yemen. Only 45% of hospitals in Yemen are currently functional, and even prior to the Saudi-led blockade, only 30% of required medicines were reaching these hospitals. According to the International Red Cross, cholera cases in Yemen could reach 1 million by the end of the year. Like most other wars in the Middle East, the crisis in Yemen is a complicated one. To begin to understand it, we must examine the underpinnings of the Yemeni Civil War. In 1962, when the King of Yemen, Ahmad bin Yahya Hamidaddin, died, conflicting ideologies and foreign powers sparked a civil war and this resulted in the Kingdom being divided in two: North Yemen and South Yemen. The conflict persisted for years until the two separated countries were finally united as the Republic of Yemen in 1990, led by President Ali Abdullah Saleh, previously the leader of North Yemen. The Houthis, officially called Ansar Allah, are a Zaidi Shi’a-led movement that started in what was called North Yemen in 1992. The movement commenced to promote a Shi’a revival against the Sunni majority. As tensions rose between North and South Yemen, the Houthis exacerbated the issue, by seeking to overthrow the government and a civil war erupted in 1993, concluding with Saleh’s government victorious. During the next ten years, the Houthi rebel group became increasingly radical. Their slogan, “God is great; Death to America; Death to Israel; God curse the Jews; Victory to Islam,” incited rage and condemnation. They regrouped in religious centres and founded an armed group called ‘Believing Youth.’ They also staged violent anti-American protests and accused former President Saleh of pandering to the President of the United States at the expense of the Yemeni people. In 2003, Yemen placed a $55,000 bounty on Hussain Badr al-Din al-Houthi, the founder of the Houthi movement. A year later, the government managed to capture and kill him in Sana’a. This sparked a war between Saleh’s government and the Houthi rebels. The result, bouts of violence at the hands of both the Houthis and the government, caught civilians in the midst. Over the years, civilian casualties reached several thousands, while even more people were displaced. In 2011, during the heat of the Arab Spring, the Yemeni Revolution took place. The fight against underemployment, corruption, and violence escalated to calls for Saleh’s resignation. The fight against the Houthi rebels was placed on a temporary hold as the government went through upheaval. After months and several defections of military and government personnel, Saleh finally resigned. For prosecutorial immunity, he signed over his power to Vice-President, Abd Rabbuh Mansur Hadi. The next few years, the Houthi rebels focused on growing their base of operations, with funding from Iran. They continued to terrorize the population in Yemen by committing acts of terrorism, mainly in the northern regions of Kushar and Mutsaba. The conflict took a new turn, when the Houthis, fuelled with anger over new oil subsidies, seized Yemen’s capital, Sana’a. By early 2015, with the help of former President Saleh, once an active opponent of the Houthis, the group secured Hadi’s resignation and dissolved the parliament. After resigning, Hadi fled to neighbouring Saudi Arabia, where he found asylum. The conflict grew more complex with a myriad of external parties becoming interested in the internal conflict. Iran was accused of seeking to create a Shi’a stronghold in Yemen, through the Houthis, which incited Saudi Arabian involvement. For the most part, the international community has remained critical of the Houthi rebels. This led to the formation of an international coalition led by Saudi Arabia and supported by President Hadi. The coalition includes the United Arab Emirates, Bahrain, Kuwait, Qatar, Jordan, and Sudan, while the United States and the United Kingdom have been providing key intelligence and logistical support to the coalition. The United States and the United Kingdom have also increased weapon sales to members within the coalition. Other countries, such as Eritrea and Somalia, have lent their airspace and naval space to help the coalition conduct their operations. The consequence was the start of the Yemeni Civil War, which officially began on March 25th, 2015, when Saudi Arabia launched airstrikes against the Houthi rebels. These airstrikes have effectively worsened the conflict. Yemen’s situation was bad enough under the territorial disputes led by the Houthis, as well as forces from al-Quaeda of the Arabian Peninsula (AQAP) but it is now a Level 3 emergency, as declared by the United Nations (UN). This is the highest level of emergency stages in the UN. Many of the airstrikes conducted by the Saudi-led coalition have been in serious violation of international laws. Civilians, their homes, and buildings should not be targeted; medical facilities should not be targeted; and strikes launched from civilian areas are unlawful. These laws are, of course, frequently ignored in times of conflict. But the Saudi-led coalition is heavily backed by many of the G7 countries that are also part of NATO and hold permanent seats on the United Nations Security Council. The countries that are hailed as enforcers of democracy within the international community at large are perpetrating one of the worst humanitarian crises of today. On December 4th, 2017, former President and ally of the Houthis, Saleh, was killed by Houthi rebels. Two days earlier, he had announced that he would put an end to his alliance with the Houthi rebels. This sparked outrage and he was murdered. The situation, desperate enough, turned even more deadly overnight. Medical teams, NGOs, and humanitarian suppliers all came under fire, literally. According to the International Committee of the Red Cross, at least 125 people were killed and 238 were injured during the fighting. Jamie McGoldrick, Humanitarian Coordinator for Yemen, called for a humanitarian pause: “I call on all parties to the conflict to urgently enable a humanitarian pause on Tuesday, December 5, between 10 AM and 4 PM to allow civilians to leave their homes and seek assistance and protection.” The pause did not come to fruition and the fighting still continues. Recent reports are now saying that the Saudi-led coalition is targeting food supplies. Data on coalition airstrikes have recorded 356 air raids targeting farms, 174 targeting market places, and 61 air raids targeting food storage sites between March 2015 and September 2017. Damian Green, First Secretary of State of the UK, has said that the UK government will not stop weapon sales to Saudi Arabia because “our defence industry is an extremely important creator of jobs and prosperity.” He said also said that Britain is “the fourth largest humanitarian donor to Yemen.” But what does that matter when the weapons manufactured are creating a need for massive humanitarian aid in the first place? The chlorine tablets that might save cholera-infected children are forbidden from entering because of the Saudi-led coalition, which is supported by the United States and the United Kingdom, in complete and utter disregard for international law. The Saudi airstrikes that are hitting the Arab region’s poorest country are further devastating the region and its people. Canada and France are two other countries that are currently engaged in lucrative arms deals with Saudi Arabia. Though Canada’s Minister of Foreign Affairs, Chrystia Freeland, “…calls on all parties to the conflict in Yemen to abide by their obligations under international humanitarian law to avoid civilian casualties…,” it is not enough. When it comes to selling weapons to Saudi Arabia, former Liberal cabinet minister, Irwin Cotler, says, “I don’t think we should be [undertaking] arms sales with a country that is engaged in major human-rights violations.” Unfortunately, even with the ongoing debate, there does not seem to be an end in sight to the weapon contracts in place and this makes Canada amongst the countries complicit in the deaths of thousands of Yemeni civilians. While the Saudis continue to commit their war crimes, the Houthi rebels have not been any better – they have been recruiting child soldiers. The UN reported a fivefold increase of children recruited into the army in just one year. This has dire consequences for future stability of the region, especially with the proliferation of IS, AQAP, and other extremist groups. As unfortunate as this is, it does not excuse coalition airstrikes or blockades designed to starve the population. Unfortunately, Western complicity is not a new concept. 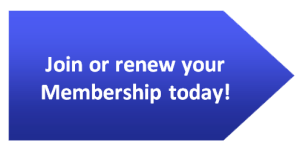 As we continue to fight proxy wars, whether in Afghanistan or in Iraq, the situation in the Middle East continues to deteriorate for the civilians that have no choice but to remain in the country. In order to hold our governments accountable, we must be aware of the situations that surround us and be cognizant of what wars our own governments are perpetuating. The war in Yemen is not anticipated to end any time soon, but the governing bodies responsible for creating the largest humanitarian crisis of today can certainly put an end to the horrific humanitarian conditions underway. 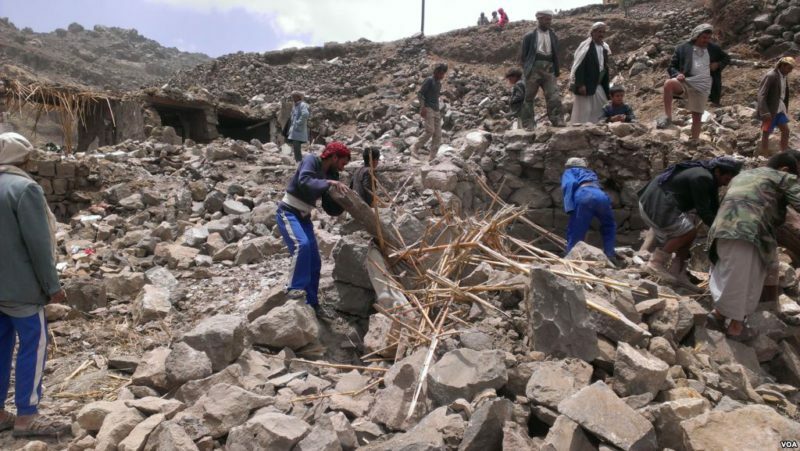 Photo: Villagers scour rubble for belongings scattered during the bombing of Hajar Aukaish – Yemen – in April 2015. Public Domain. 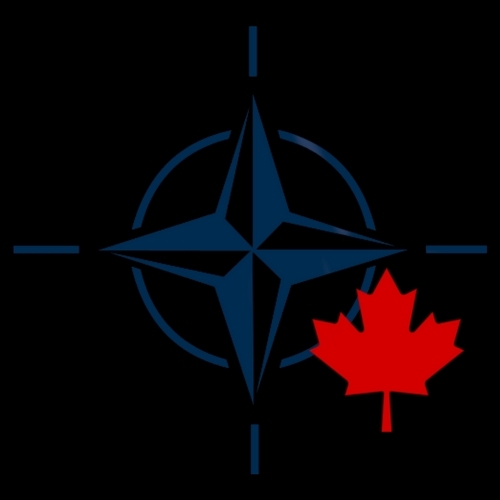 Disclaimer: Any views or opinions expressed in articles are solely those of the authors and do not necessarily represent the views of the NATO Association of Canada.